2 bdrm 1.5 bath home on private leased land, perched atop the cliffs of Labufadora, 2 hrs south of CA border, in Punta Banda; overlooking the Pacific. Watch the blowhole from your easychair. 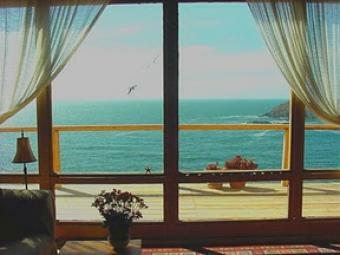 Watch gray whales as they swim by, dolphins and seals play in the cove below. Hear Mariachi music from across the cove. Watch incredible sunsets every night. EXTREMELY private-no thru traffic. Free private beach & a boat ramp for your use, both within walking distance. Swim, fish snorkel/scuba from the beach or just enjoy the sunshine. Wireless internet, & phones installed. Palapa garage, workshop, workroom and boat or car storage. Laundry room. 20x12` enclosed tiled courtyard for pet containment, with native succulent garden. New kitchen & bath floor tile, new deck, BRAND new pila. Imported Italian tile throughout on steps, countertops & working fireplace. Propane wall furnace. Master walk in closet- walk in kitchen pantry.